Brimbank Park is only 15 kilometres out of Melbourne city, and yet, embarrassingly, I hadn’t bothered to make the trip up there until about two weeks ago. It’s full of a wonderful range of native plants and wildlife, and even though it’s quite close to the hugely developed Melbourne Airport, it feels like it’s hundreds of miles away. It’s a welcome escape from the residential areas I’ve become so accustomed to. Visiting parks like Brimbank always make me wistful. I’m struck by an awareness that once, everything would have looked like this - minus the picnic spots and water fountains, of course. The north-western suburbs of Melbourne have seen rapid increases in development in the last few years. From Yarraville to Footscray, and stretching out past Keilor, both residential and industrial developments have transformed the suburbs significantly in the last 50 years. It’s almost impossible to fathom the changes made to these areas over the last 300 years, before airports, roads, pavement or farmland. Prior to European colonisation, Maribyrnong River and the surrounding areas were an expanse of trees, shrubs, and grassy plains. Up the northern area of the river, which now runs through Keilor and up alongside what we now know as Melbourne International Airport, the river was surrounded by fertile, rich scrubland. Narrow-leaf peppermint would have arched over the water, reaching up to 15 metres tall. Kidney-weed, hairy panic and wingless bluebush would have been common, most of the soil covered by these low-lying species, with only a few larger shrubs and medium-sized trees poking up between the competitive grasses. Away from the river, the trees died back, replaced by a sweeping grassland that occurred across Keilor and Tullamarine, stretching down as far as Essendon North. Grasses such as kangaroo grass, mat grass and kidney-weed would have swept across the area, providing vital habitats for native species, in particular invertebrates. Melbourne’s International Airport, now paved and developed into a hub of transport, was once an expanse of grassy plains, home to some of the 140 species of butterfly found in Victoria, such as the orchard swallowtail and grassland copper. Closer to what we now call the suburb of Maribyrnong, the habitats surrounding the river shifted to riparian woodland. Here river red gum, manna gum and Gippsland red Gum towered up to 20 metres alongside the water, herbs and shrubs making up the understory as the river swept around bends. Quickly, though, the salty waters of the Maribrynong River would have taken hold, and these great trees would have died back. Even today the river is flushed with salty water from coastal swells, though you wouldn’t realise it when you look at the lush grass along Flemington Racecourse. 300 years ago, these swells affected the habitats as well, sending salt through the soils surrounding the river. The only plants that prospered were ones that were adapted to the salty waters, predominantly low-lying species such as variable willow-herb, creeping brookweed, white sebaea, and Australian salt-grass. Almost no trees would have been found in these areas, the salty soils keeping them at bay. With all of this in mind, it is no surprise that the Maribyrnong River Trail is one of the most scenic in Melbourne. Scattered with parks and picnic areas, it meanders into Melbourne city much like the river itself, lazily looping around suburbs and landmarks. It is particularly popular on weekends, with dog-walkers, families, and fitness enthusiasts making their way along the pathway at their own pace. 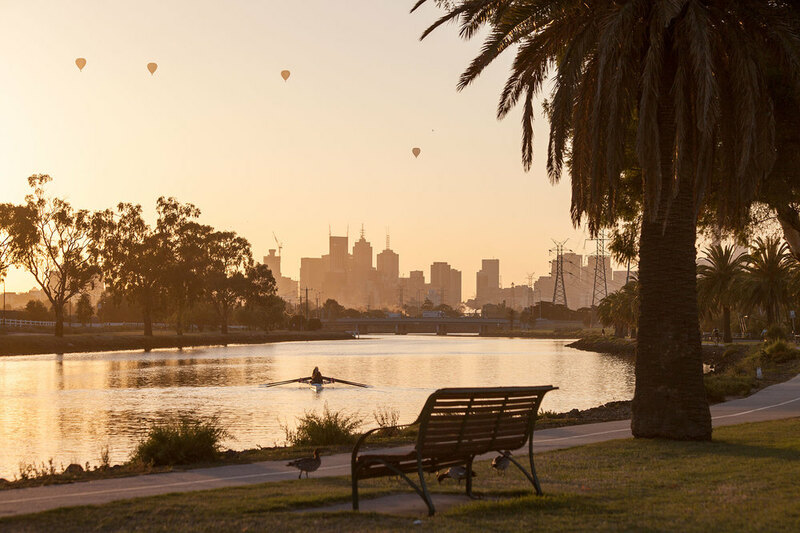 Though the surrounding areas of Maribyrnong, Footscray, Yarraville, Ascot Vale, Keilor, Flemington, and Kensington have seen much development in recent years, the winding nature of the river has helped shape these suburbs into what we see today.